This guide is for the Sega Master System, Sega Game Gear, Sega Genesis, Atari Lynx, MS-DOS, SNES, Sega CD and Commodore Amiga versions of the game. For the NES version, see Batman Returns (NES). 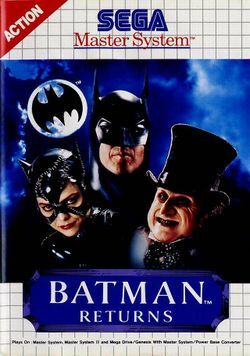 Batman Returns is a platform game, that was originally developed by Aspect for Sega, and released upon the Sega Master System and Sega Game Gear in 1992 (in Brazil it was distributed by Tec Toy); it is based upon the film of that same name, and it was later redeveloped by several other companies on the Sega Genesis, Atari Lynx, MS-DOS, NES, SNES, Sega CD and Commodore Amiga. The NES version, which was developed by Konami before the SNES, is also significantly different to the others. This page was last edited on 5 March 2017, at 12:36.